Steve was born and educated in Portsmouth. He joined the Royal Marines Band Service in Deal in 1967 where he specialised in flute and saxophone. In the over 24 years he subsequently spent in the RM, highlights included 12 years serving on the Royal Yacht Britannia involving two royal honeymoons and visiting Islands in the South Pacific. During his time in the Royal Marines, Steve took the opportunity to widen his experience in conducting whenever he could. From 1989-1992, during his last three years of service, Steve was appointed director of the Royal Naval Volunteer Band in HMS Nelson, a post which coincided in 1989 with his subsequent appointment as Musical Director of the Highbury Area Band, a post which he held until 2010. Upon leaving the Royal Marines in 1992 he took his teaching diploma and began working full-time as a peripatetic woodwind teacher with Hampshire Music Service. 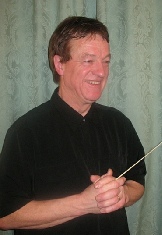 He is a founder member and conductor of the Solent Symphony Orchestra (formed 19 years ago), works for Portsmouth Music Service as Musical Director for Portsmouth Junior and Senior Wind Bands and also directs school bands and orchestras in the Portsmouth and Gosport areas. Steve was MD for productions of Chess and Oliver and subsequently has become MD for Humdrum Amdram’s musical productions over the last 8 years. These have included Children of Eden, Titanic the Musical, Little Shop of Horrors, The Full Monty, How to Succeed in Business Without Really Trying, Seussical the Musical and Bad Girls. With all this conducting and teaching Steve still finds time to play flute, clarinet and saxophones in function bands, holiday camps and pit orchestras. Among his many solo performances, Steve played Malcolm Arnold’s Concerto for Flute and Strings with the Portsmouth New Music Orchestra and in recent years has played first flute for the Petersfield Orchestra and lead flute for the Royal Marines Association Concert Band. In 2009 Steve was voted Best Classical Music Act in The News Guide Awards principally for his work with the SSO. Steve has three grown up children. Away from music Steve likes to relax on his boat fishing in Langstone Harbour, spends time with his five Shih Tzu dogs and enjoys swimming, keeping fit at the gym and has taken up golf again!